Have it your way in Portia. My Time at Portia joins the long list of simulation games that harken back to the early days of series like the Sims, Minecraft, and the Dragon Quest Builder games, which recently found their way to the Nintendo Switch. There is also a crafted mix of Animal Crossings, Stardew Valley and Harvest Moon winks and nods which make My Time at Portia an eclectic mix of greatest hits yet it paves its own way as it sets out to build the world of Portia. Pathea Games isn’t new to video games, but the adventure, role-playing, simulation genre is one that it seemed to barrel into head first. While Portia is a largely ambitious project the game tends to do more good than bad for the genre and makes for a worthwhile addition to a Switch owners growing library of similar titles. The story starts with you inheriting your grandfather’s workshop, which sounds a bit familiar. You are quickly greeted by people in the town and asked to do a few small missions like gathering items, building a bridge, and finding a missing pet. Along with taking on the townspeople’s missions you can spend your time working on building up your own workshop and making your house a home. As you balance the tasks that people send you, and your own nest egg the world of Portia opens up and you will quickly realize that you can do what you want how you want at your own pace. In the early game there isn’t a lot that you can do, due to the fact that you have low-level weapons and tools, but if you pace yourself and work hard to cut down the small trees, gather items found on the ground, and visit the abandoned mine from time to time you will soon build up your wealth. Once you have gained enough gols, the currency in Portia, to upgrade those weapons and tools you will be able to work faster and cut down larger trees and mine huge stones found throughout the town. Items you gather fall into a few categories. There are consumables which will replenish your HP and Stamina, which are lost by taking damage from enemies and creatures found in the world and by doing work around the town. Most ever task you do, like swinging an ax, picking up items from the ground, or chopping a tree will use up stamina points. Those points refill each day after sleeping, but once you are out of them during your waking hours, there isn’t much work that you can do. Other items you find can be used at the various workbenches, cutting machines, or furnaces that you will build at your workshop. These building tasks need to be balanced between items you place in your house, which can provide you with buffs to stats like defense and HP boosts. Then there are other items you build, which will be used to complete daily commissions you take on to help out folks around the town of Portia. Then there are building items which will be used to actually change the world of Portia, from simple bridges, vehicles for fast travel, and a system of irrigation items which will bring life back to the forest. As you make your way through Portia’s story, it’s easy to get hooked on completing missions for townspeople and gaining friends as you boost your relationship points. Along with relationship points, turning acquaintances to friends, there is a bit of courting you can do as well. Early on in my playthrough, I met a grandmother that kept encouraging me to send her granddaughter gifts or show up to dinner. While I appreciate that added relationship, dating, marriage aspect of the game, it was probably one of the parts I found least interesting to me. Mostly because I have my real-world wife and kids to deal with and games are a way to escape adulthood and responsibilities like that. There is a real sense of progression in My Time at Portia, as well as a sense of satisfaction gained by small and large gameplay elements opening up as you gain experience, learn to build and craft new items and tools, and as you explore the world and all it has to offer. I often found myself working a few in-game days on a set goal or task, while also picking up secondary items or missions, just by interacting with folks. From time to time I would set off in hopes to accomplish a main story mission, only to be distracted by cutting down trees, exploring a mine for relics, or going off and fighting with the llamas to get some fur. In many ways, the mission and side-questing in My Time at Portia reminded me of the way I played through The Legend of Zelda: Breath of the Wild. In Breath of the Wild, I would often set out to do one thing, conquer a shrine, or dungeon, only to be taken in by a side quest looking for something or hunting down an obscure Korok seed. If you have played any number of the aforementioned world-building games, sim-style games where you own a piece of land, or farm, etc. and the goal is to build yourself a proper home for yourself, you will feel right at home in Portia. The game features a vast number of objects that you can build and place inside your house and the uniqueness in which you can apply them to your home and workshop will more than likely be something gamers will share with their friends. Too bad there isn’t multiplayer in My Time at Portia at the time of release, or on the horizon by the developers. Visually My Time at Portia is somewhat akin to a 3D-ifying of Stardew Valley as the characters for the most part, have a lanky/cartoon-like design approach and buildings aren’t as straight and rigid but have small bits of curves and whimsy added into their eves and edges. The cast of characters range from nerdy doctor types, a group of short rotund brothers, bearded swordsman, yoga mom’s, mischievous children, and more. Each character you meet has intriguing taste in food, drink, and items they wish for you to find and no two characters were too similar that they blended together. Finding certain characters was sometimes the hardest part as each NPC is free to live their own life and walk around Portia, though those that have their own shops can often be found inside their building or near their register daily. While My Time at Portia has a great variety of missions, characters, an explorable world, and things to do…it severely lacks in audio department. While I didn’t care too much that the soundtrack and game audio was minimal, or non-existent in some areas, it could use a bit of beefing up in future patches of the game. I did have a few audio bugs that popped up, like one time where the rain sound would cut out during a cutscene for no apparent reason, or chopping sounds were not in sync with the actual wood cutting I was doing at the time. The game also has a basic background track that plays over…and over, and it’s quite repetitive. The only time the sound track really seemed to change was during a battle sequence where I was cutting down llamas or other creatures. During my time spent with My Time at Portia, I played almost exclusively docked. I did notice some frame rate drops while in docked or handheld mode, none of which seemed to take me out of the experience. While I played I had noticed that if I played for longer periods of time without actually shutting down the game, that the loading screens when going in and out of buildings seemed to hitch a bit more each time rendering the screen black or static on the artwork backgrounds of the town for sometimes over a minute. Entering my inventory also seemed to be hiccup from time to time, but that never seemed to be a consistent issue. I did notice that sometimes there was a great deal of pop-in happening in the background as trees and characters slowly came into view. However, usually these things happened well off into the draw distance. Occasionally I came across an errant character that would walk in and out of a cut-scene if that scene happened to happen during their walk cycle. My Time at Portia is a lot of game, and a lot of hours and will keep you busy for 50+ hours just to complete the main story campaign. What you do with your time is going to vary vastly between anyone you talk to. For instance, I am not great at fishing, so instead of taking on fishing missions, I would spend my time mining and gathering resources and complete crafting missions. I found some characters often asking for me to build things for them which led to larger commissions which I found fun in completing. The fact that My Time at Portia has such a variety and that each gamer can really make the world and the game their very own unique experience is a testament to the team at Pathea Games. They really should be commended for their hard work at bringing their well-loved world of Portia to Switch. 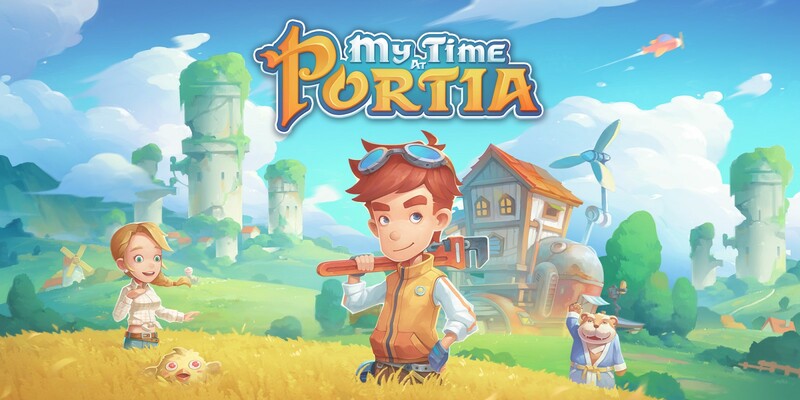 I highly recommend you visit My Time at Portia now, especially while you wait for Animal Crossings to come to the Nintendo Switch.